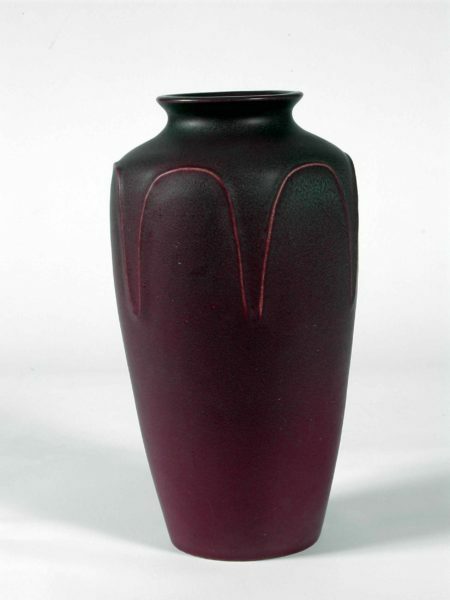 Vase, Rookwood Pottery, 1912, glazed earthenware, 12 3/4 x 7 x 7 inches. Gift of Delphia Allen Lamberson and Hoke Smith Holt, 2003.10.83. The manifestation of the Arts & Crafts style in the United States is due in large part to the impressive productivity of several art potteries at the time. An art pottery was a business in which decorative ceramics were mass produced but finished—and often painted in detail—by hand. Even more significantly, at a time before women had the right to vote, they led the way in these potteries, thereby dictating the taste of fashionable decorative arts to collect and display in one’s home. After the 1876 Centennial Exhibition in Philadelphia and its Women’s Pavilion, American women were presented with the possibility of creating artworks in a way that was considered acceptable for middle class women of the day. These inspired women were not only incredibly talented but also proved to be innovative entrepreneurs in the early 20th-century revival of craft. Speaker Whitney Richardson, the Museum’s assistant curator, specializes in craft, decorative arts, and architecture of the 20th and 21st centuries. She recently curated Symbols of Asheville, an exhibition looking at the city’s Art Deco masterpiece: its city hall. In her previous position at The Wolfsonian, she contributed to over a dozen exhibitions. She holds an undergraduate degree in architectural history from Columbia University, and a graduate degree in the history of design & decorative arts from Glasgow University. Join us at 4:30pm for an optional architecture tour of St. Mary’s Episcopal Church (1914), whose red-brick original structures were designed in the Arts & Crafts style by Richard Sharp Smith, the resident architect at the nearby Biltmore estate. Online ticket sales closed 2/16/19, 12pm. Limited tickets available at the door. Presented in partnership with the 32nd National Arts & Crafts Conference at the Omni Grove Park Inn and St. Mary’s Episcopal Church.